Every forest has its own story to tell, some of which are amazing and are filled with the beauty of nature. But some have their own dark legends and there is no need to explain them with the living tongue, because, they are enough eerie to creep us out just as like the Hoia Baciu forest in Romania has. 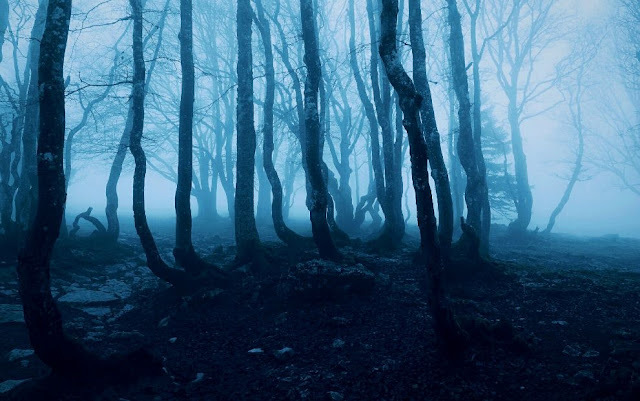 The Hoia Baciu forest located in Transylvania, Romania is said to be immensely haunted, carrying hundreds of spooky tales and unusual phenomena that will chill you to the bone. Covered with a misty air, the trees are unnaturally bent and twisted that makes this wood an ideal backdrop in a horror movie. So that, anybody could get a dreadful feeling from its strange appearance. Numerous visitors after coming back from "Hoia Baciu trip" have terrifyingly claimed that burns and rashes were regarded on their bodies for no obvious reason. Some of them even claim to have skipped a few hours while they explore among the spooky trees. They haven't any explanation for why they cannot recall what occurred at the points of those 'missing' hours. Many consider that the ghostly apparitions loaf around in the forest and the locals constantly avoid this woodland during the day-light too. It's miles rumoured that the floating heads and disembodied whispers can be occasionally seen and heard within the darkness of the trees. Eventually, in 1968, a curious tourist named Alexandru Sift took the photograph of a strange object inside the forest and many people to retain believing it an extraterrestrial thing or so-called UFO, claiming the existence of a Time Travel Portal somewhere in the forest. There is another horrific story that goes, once a shepherd ventured into the forest along with his two hundred sheep and suddenly disappeared with all of his cattle and have never been seen again. There are numerous theories to be put forth and numerous thoughts that could be the viable cause however neither the paranormal investigators nor the sceptics have strongly concluded these unnatural phenomena of Hoia Baciu forest into their single-theory. Hoia Baciu Forest is one the most attractive places in Romania, which is visited and revisited by thousands of paranormal seekers every year to get some new experiences of their haunted tours. So, if you are also one of those paranormal lovers and in the quest of mysteries, you should visit this forest for at least once. So at first, you have to know the proper address of this haunted forest in Romania. The Hoia Baciu Forest is situated to the west of the city of Cluj-Napoca, near the open-air section of the Ethnographic Museum of Transylvania. Therefore, you have to reach the Cluj-Napoca city first. It's a well-developed city and easily accessible by all modes of transport from the other major cities and towns in Romania. Hence, you can simply go to the region of Hoia Baciu Forest from anywhere in the country. After reaching the city, you could catch a cab addressing straight to the forest. It's about 11 kilometres away from the main city, that should not take more than 30 minutes of your journey. However, the Hoia Baciu forest has seen many deaths and disappearances so we suggest to beware if you are planning to make it your destination. Visit this place only if you are on the quest for solving mysteries surrounding the paranormal happenings.